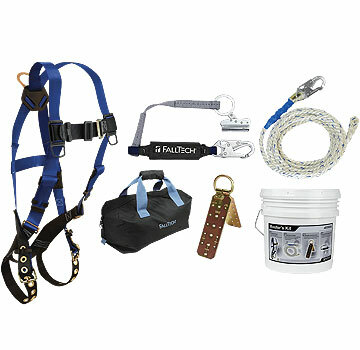 PRODUCT: FALLTECH'S PREMIUM ROOFER/CONTRACTOR FALL ARREST / PROTECTION KIT SYSTEM. INCLUDES COMFORT-FIT 5-POINT FULL BODY HARNESS, 50' LIFELINE, SHOCK ABSORBING LANYARD, ROPE GRAB, RE-USEABLE ROOF ANCHOR & HEAVY DUTY CANVAS BAG. MEETS ANSI Z359.2007. SHIPS IN 5G BUCKET. PRICE/KIT. FALLTECH'S BEST ROOFER/CONTRACTOR FALL PROTECTION KIT. A PREMIUM KIT AT A GREAT PRICE. #5007L HEAVY DUTY CANVAS STORAGE BAG WITH POCKETS. #8150 5/8" X 50' LONG, LONG-LIFE, 8,500 Lb. POLYESTER VERTICAL LIFELINE ROPE WITH DOUBLE LOCKING SNAP HOOK FOR ANCHORAGE CONNECTION, AND STEEL THIMBLE EYELET. SNAP MEETS 3600LB GATE STRENGTH. #8368, 3' CLEAR-PACK, ULTRA SHOCK ABSORBING LANYARD WITH 5/8" SELF-TRACKING STEEL ROPE GRAB, HEAVY DUTY DOUBLE LOCKING SNAP HOOK, SERIAL CODING. TO MEET OSHA AND ANSI STANDARDS. #7480 AUTOMATIC / SELF TRACKING ROPE GRAB FEATURES SOLID STEEL CONSTRUCTION, SINGLE CAM & ROLLER, PERMANENT ATTACHMENT TO LIFELINE. #7410, HINGED, RE-USEABLE ROOF PEAK ANCHOR. KIT MEETS OSHA 1926 AND ANSI Z359.2007 STANDARDS. Guardian #01121 18 in. Positioning Lanyard / D-Ring Extension. Has D-Ring and Double Snap Hook. NOT SHOCK ABSORBING. Meets the requirements of OSHA 1926 and ANSI Z359. Price/Each.